"Information Without Borders" Just a blog about technology, security, and people. It’s 2018. The age of technology is in full swing and we have everything from smartphones to smart watches, and even the infamous smart juicer. That’s why it baffles me that people still fall for false medical claims and crazy theories such as essential oils and alternative medicine. Ironically, the people who fall for these the most are those who told us not to “trust everything we see on the internet” as we grew up. Upon searching for essential oil cures on google, a “lovely” website ironically named thetruthaboutcancer.com shows up as the top result. Unfortunately, the website is admittedly well-made and has a large following, evident by the amount of times their crazy articles get shared. Written by someone named Ty Bollinger, this article reeks of pseudoscience and tin-foil hats. I will commend him, however, on his warnings on the application of essential oils. Maybe he isn’t as crazy as he seems. Surprisingly reasonable for someone preaching essential oils. However, despite these warnings, the claim that essential oils have the potential to “fight” cancer is dangerous, and could lead to someone’s death. Some patients reject standard, proven cancer treatments such as chemotherapy in favor of essential oils, which have limited, if any, effectiveness. Despite this, various groups and communities still consider essential oils and healing crystals the epitome of medical technology. Many of these groups can be found on Facebook, and are commonly full of shills for doTerra, a pyramid scheme built upon the foundation of essential oils. 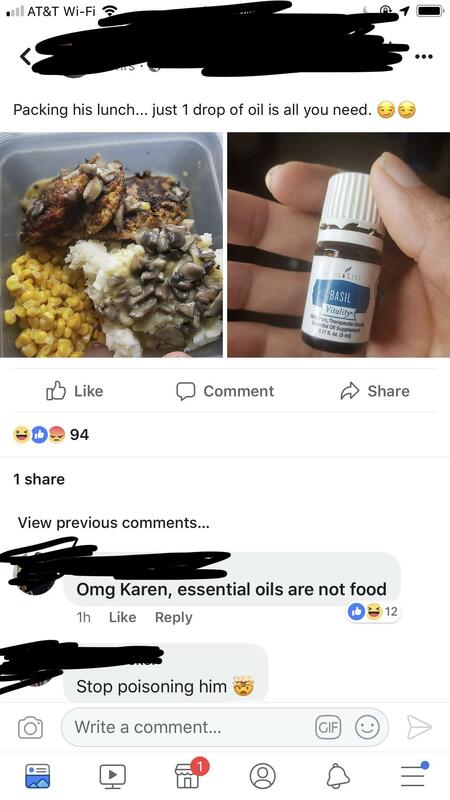 Some people even go as far as to put these essential oils in their food for “flavor” instead of just using the actual, edible, ingredient. Why don’t you just put actual basil in there?! It’s cheaper! Unfortunately, this practice can be extremely dangerous, and essential oils should never be put into food, no matter how diluted, until it is turned into water. Now, I would like to conclude this article by stating that, in no way am I bashing the use of aromatherapy, a practice closely tied to essential oils. Rather, I’m just denouncing the use of false claims and pseudoscience that many companies use to sell the product. These false claims could lead to very dangerous situations where lives could be at stake, and that is simply wrong. If you insist on using essential oils for therapeutic reasons, I recommend that you follow some very basic guidelines to keep you and your family safe.